2. While explaining the background and the context in which the meeting of Nodal Officers was held, it was brought Out in the meeting that after the receipt of the report Of the 7th Central Pay Commission on 19.11.2015, Ministry of Finance initiated a proposal to setup an appropriate mechanism to process the recommendations Of the Commission. With the approval Of the Cabinet. an Empowered Committee Of Secretaries (E-COS) headed by the Cabinet Secretary has been set up on 27.1.2016 to screen the recommendations and to firm up the conclusions for approval Of the Cabinet. An Implementation Cell (IC), as a dedicated and focused wing in the Department Of Expenditure (DOE) has been created to work as the Secretariat for the E-CoS.
3. AS the recommendations Of the Commission relate to various Ministries/ Departments, their views/comments would be essential to process the matter for submitting the same before the E-CoS. JS(Pers), D/o Expenditure wrote a D.O. letter to the Secretaries Of various Departments on 21.11.2015, wherein all the Departments were requested to formulate their views/comments on the recommendations of the Commission pertaining to them after taking into account the representations of the Staff Associations and also to nominate a Joint Secretary level Nodal Officer for interaction with the Implementation Cell. While a number Of Ministries/Departments have sent their comments and nominated their Nodal Officers, the comments received from some Ministries are simply in the nature of forwarding the representations of the Staff Associations without their comments. (i) Departments who have not yet nominated a Nodal Officer, should do it within the next 2 days. (ii) To be ensured that Nodal Officers are not changed midway, unless extremely unavoidable. (iii) Nodal Officers may get acquainted with the recommendations of the Commission as specifically applicable to their Departments. Nodal Officers to find out which Wing/Office (attached or subordinate or UT) is concerned with the recommendations of the Commission. The mechanism of Nodal Officers should also be put in place in attached/ subordinate/lJTs so that the comments of such offices could be properly coordinated at the level Of the Department concerned without any further delay. iv) The comments Of the attached/subordinate offices/UTs should be compiled by Nodal Officers at the Department level itself. (v) Nodal Officers to take note of any representation or demand Of the Staff Association under the administrative purview Of their Department, Nodal Officers to ascertain the views/comments of the concerned Office on the recommendation Of the Commission in the light Of the representation /demands raised by the Staff Association. (vi) In case, there is any need for consultation with the Staff Association at the level Of the Department, the same may be done as per the assessment Of the Department. (vii) Thereafter, the formal views/comments of the Department should be sent to the Implementation Cell (IC) on the recommendations of the and directly related to that Commission, which are specifically Department. (ix) In case of any modification, the extra financial implications (per annum) over the recommendation Of the Commission should be Clearly indicated. (x) If no modification Of the recommendations Of the Commission is suggested, approval Of the Secretary of the Department should be Obtained before sending the recommendations to the Implementation Ceil (IC). If, however, any modification is suggested, approval of the Minister should be obtained. (xi) While the views/comments of the Departments on the recommendations Of the Commission directly and specifically applicable to that Department are mandatory. a Department is free to offer views/comments on the recommendations which are Of general nature or concerning other Departments. (xiii) Nodal Officers shoud regularly keep a watch on the website Of the Finance Ministry at the link http://www.finmin.nic.in/the ministry/dept expenditure/notification/7cpc/index.asp. E-mails Should also be checked regularly for the purpose. The updates/further action to be taken shall be posted there to facilitate quick action. 5. Apart from the above action points, it was also felt that sub-groups may be formed after the receipt of comments from the Ministries/Departments to accord focused consideration to certain specific issues, if necessary. (i) Even if the Department has no comments, it should send a response, saying that it has ‘Nil Report’. (ii) While certain Departments have already given their comments, these comments would be sent again in the ‘prescribed format’ and in accordance with the points brought out in para 4 above. (iii) Nodal officers would ensure that the comments of their Departments on all the recommendations Of the Commission and also on the representations received so far from the Staff Associations are forwarded to Implementation Cell (IC) in the prescribed format in a consolidated fashion and not in piece-mealwithin next two weeks. (iv) If a representation was made by a Staff Association before the 7th Central pay Commission and the Commission after due diligence has not accepted the demand made therein, the same matter should normally not be considered at this stage. However, if Departments consider that the issues are of such nature that they require consideration at this stage also, then they may give their comments with full justifications to the Implementation Cell (IC). 7. With the above discussions, the meeting ended with a vote of thanks to the Chair. 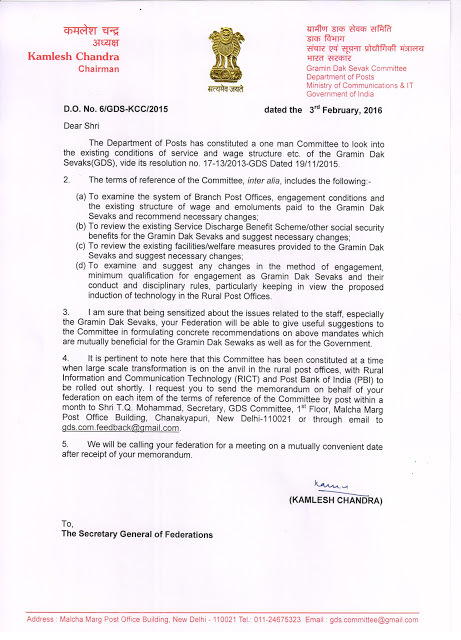 Request for submission of Memorandum to GDS Committee constituted by Department of Posts. 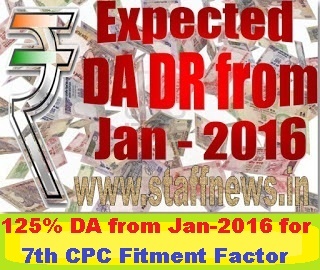 125% Dearness Allowance from January 2016 is confirmed now after releasing of December, 2015 AICPIN, which was already speculated by Seventh Pay Commission and was taken as fitment factor for determination of new pay matrix. 5.1.27 The starting point for the first level of the matrix has been set at Rs.18,000. This corresponds to the starting pay of Rs. 7,000, which is the beginning of PB-1 viz., Rs.5,200 + GP 1800, which prevailed on 01.01.2006, the date of implementation of the VI CPC recommendations. Hence the starting point now proposed is 2.57 times of what was prevailing on 01.01.2006. This fitment factor of 2.57 is being proposed to be applied uniformly for all employees. It includes a factor of 2.25 on account of DA neutralisation, assuming that the rate of Dearness Allowance would be 125 percent at the time of implementation of the new pay. Accordingly, the actual raise/fitment being recommended is 14.29 percent. Providing a boost to the e-commerce industry in India, the post departments had handled cash on delivery (COD) orders worth Rs.500 crore up to March 2015 and is expected to reach about Rs.1,500 crore by end of 2015-16, Communications Minister Ravi Shankar Prasad said on Thursday. Till December 2015, the COD value has crossed Rs.1,000 crore. Speaking at the meeting of the Parliamentary Consultative Committee attached to the communications & IT ministry, on the e-commerce initiatives of the department of posts, he said various steps taken by the department for gearing up its capabilities for handling e-commerce parcel business as well as introducing services such as COD have revolutionized the e-commerce business in India. Prasad also said the government's initiative to digitalize functioning would help in making e-commerce reach every corner. He said the initiative would further enhance IndiaPosts' reach as national carrier. The department of posts had set up 48 new parcel processing centers so far and nine more such centers are coming up during the current financial year, he said. "These efforts in the last eighteen months have resulted in an overall revenue growth in the parcel segment by 45 percent during 2014-15 and more than 100 percent in the current financial year," Prasad said. CHENNAI CITY NORTH DIVISION, CHENNAI- 600 007. In the 28th Biennial Divisional Conference held at Park Town HPO on 17-5-2015 the following Office Bearers have been selected. Auditor: S.Suresh Babu, PA, Vysarpadi. o This is for your kind information please. Dopt Orders - Declaration of Holiday on 14th April, 2014 – Birthday of Dr.B.R. Ambedkar. Dated the 12th March, 2014. Subject: Declaration of Holiday on 14th April, 2014 – Birthday of Dr.B.R. Ambedkar. It has been decided to declare Monday, the 14th April 2014, as a Closed Holiday on account of the birthday of Dr. B.R. Ambedkar, for all Central Government Offices including Industrial Establishments throughout India. FNPO CHENNAI CITY NORTH DIV. Awesome Inc. theme. Theme images by molotovcoketail. Powered by Blogger.